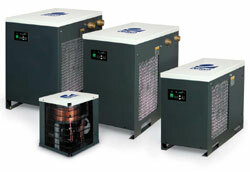 Buy from an Authorized Champion Distributor with over 37 years Air Compressor experience. come mounted with many popular accessories and are factory tested. EXCELLENT WARRANTY ON COMPRESSOR PUMP, TANK and MOTOR. Normally ships within 24 hours of your order. Available with horizontal or space-saving vertical tanks. Affordable and dependable. Champion compressors are shipped ready to install and operate. Champion reciprocating compressors are ideal for automotive services, industrial facilities, car washes, wood working shops and dry cleaners. Champion Gas & Diesel Engine Driven Portable Industrial Air Compressors are designed for areas where electrical service is unavailable. Engine mounted Champion portable air compressors meet the needs of field or truck and road service applications. Specific units are available to be operated with gas or diesel fuel, often referred to as gas air compressors or diesel air compressors. Comes with an excellent standard and extended Warranty. 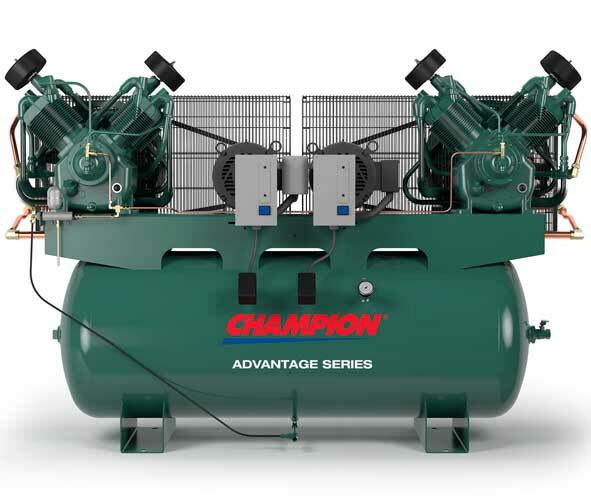 Champion Advantage Duplex Air Compressors can operate one compressor at a time, alternating between the two compressors, or when required, operate together to provide double the air delivered on a single unit. 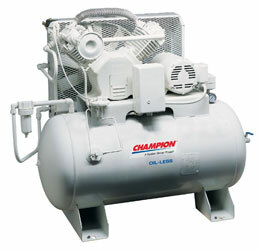 Champion Duplex air compressors are often used in automotive, industrial and commercial applications. Affordable and dependable. 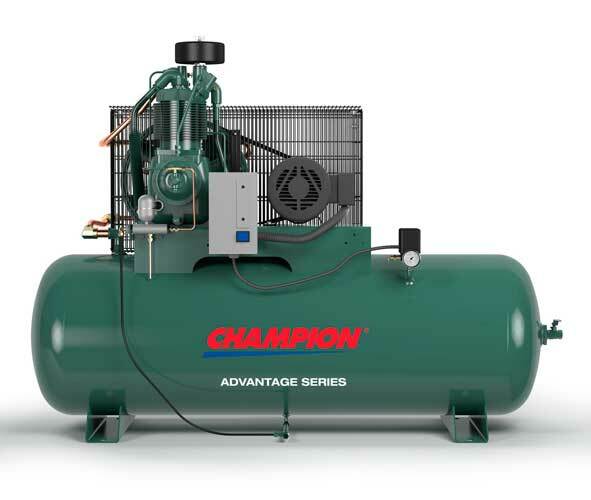 Champion reciprocating duplex air compressors are ideal for auto garages, industrial facilities, car washes, wood working shops and dry cleaners. Champion Air Compressor Pumps are loaded with rugged features to deliver high performance, long life and tremendous value. Single stage pumps are typically used for pressures up to 125 pounds and two-stage compressor pumps are available up to 250 pounds. Order your Champion air compressor replacement pump here and save. 1 year warranty when used as a replacement. 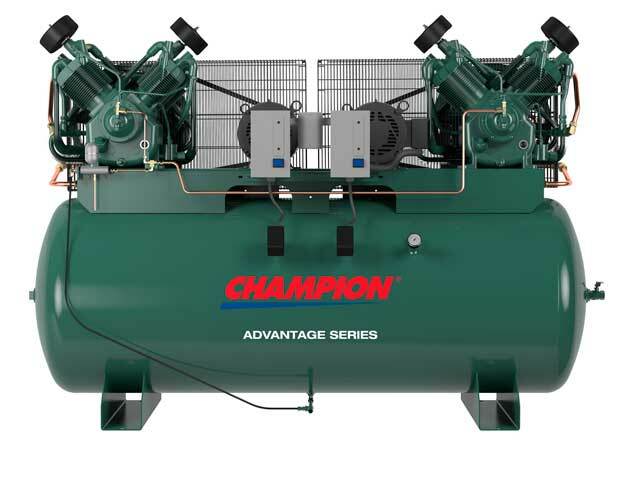 Champion Refrigerated Compressed Air Dryers are built with quality components and engineering excellence to ensure you of a stable 38°F pressure dew point drop. Easy access and installation and maintenance. 5 Year Warranty on Heat Exchanger. Champion Service kits include enough lubricant, air filters, and oil filers (where applicable) for one complete service. 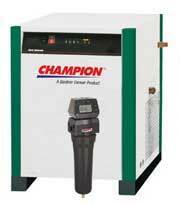 Champion Air Compressor recommends that regular service be completed on its pumps for maximum operating efficiency. Regular use of Champion Service Kits will increase the length of life of your air compressor. Oil-less is better. Whether it’s healthcare, instrumentation, or lab applications, the need for pure, environmentally clean compressed air is growning. The MTO II line of Industrial Air Compressors and prices listed here include the most popular Industrial options. One (1) year warranty on the compressor pump and all other parts and components. 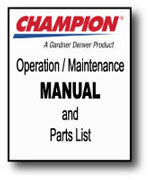 Each NEW Champion Compressor comes with an operations manual and parts listing. If you cannot find your manual -you can order one today. >CLICK HERE to see if the manual you need is listed on our site. and are available for $25 each. Champion offers the latest in tire inflation- NITROGEN. Nitrogen is a safe, non-flammable gas used by NASA, the U.S. military, NASCAR and the airline industry for tire inflation. Better retention of tire pressure, improved fuel economy and longer tread life, reduction in oxidation. Download Champion Air Compressor brochures - FREE- to get valuable technical data and information to help you select the correct equipment for your application. Brochures are in a DOWNLOADABLE PDF format. 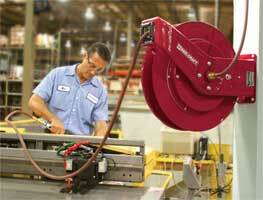 Need Air Hose Reels to meet OSHA Standards? as well as reels for oil, grease, water & other fluids, plus electrical cord reels and welding cable reels. to improve Compressed Air Quality & Efficiency! • Gas & Diesel Portable CompressorsGas air compressors are great for work trucks, farms and construction sites. 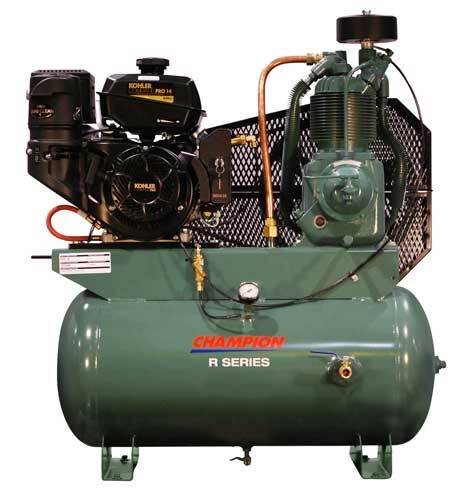 Gasoline and Diesel Engine air compressors can operate where there is no electrical connection. 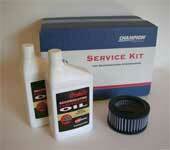 • Service KitsFind the Champion Service Kits with the proper Oil and Filters you need to service your compressor. • Nitrogen Tire InflationChampion® offers the latest in tire inflation- NITROGEN. Nitrogen is a safe, non-flamable gas being used by NASA, the U.S. military, NASCAR and the airline industry for tire inflation. • Compressed Air System MaintenanceTips on how to maintain your compressor for RELIABILITY and get the best return on your investment.